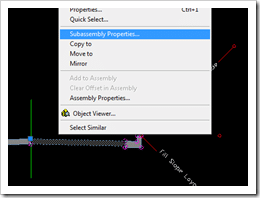 Just as not all subassemblies can transition, those that can don’t have to. By default, the “BasicLaneTransition” is not set up to transition and effectively works the same as a normal (non-transitioning) lane. 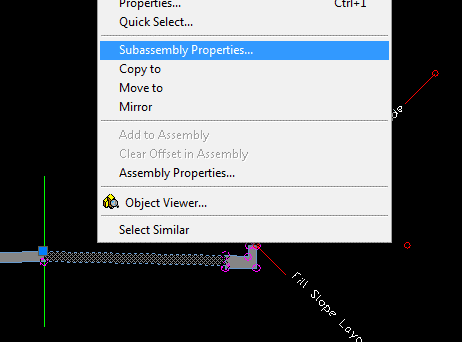 To configure the transitioning of our “BasicLaneTransition” subassembly, select it within your assembly and right-click to select “Sub Assembly Properties. Feature Line (or Alignment if you so choose). For today’s example, I want to use the grade from my Subassembly, and my Feature Line simply define the point where I would like to stretch my Subassembly. Given those parameters, I am choosing the “Hold grade, change offset” option. TIP: I personally find it easier to keep things straight when I name my transition entities to reflect which side of the road they are. So I’ll name my left-side subassembly “-LEFT” or some other variation. 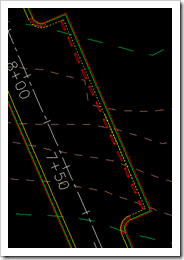 AutoCAD Civil 3D 2009 allows us to create Feature Lines one of three separate ways; Draw (from scratch), From Object (already in my drawing), or Alignment. In my particular drawing the road EP has already been drawn, and so I can simply convert it into a Feature Line. The transition I am building is for some parking stalls to the side of my road. 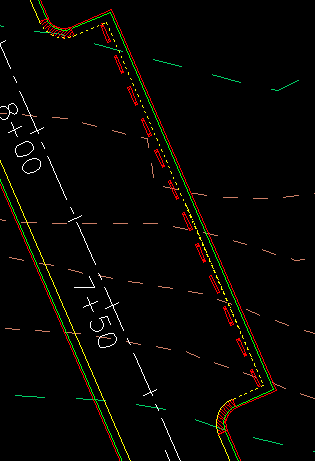 So Civil 3D treats my parking stall as a single linear entity, I am going to first make a polyline of the EP in my transition area. 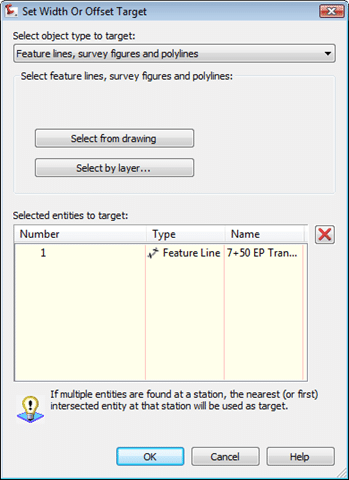 After creating a polyline of the EP within my transition area, I am now ready to convert it into a Feature Line. This can be done by going to “Grading > Create Feature Lines from Objects”. 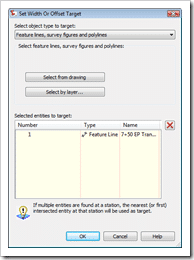 After launching the command, select the polyline you just created from your EP. Even though we’ll graphically select our Feature Line, I personally prefer giving Feature Lines being used for transitions a logical name. In this case I will name my Feature Line “7+50 EP Transition”. Doing this doesn’t change how the software functions, rather helps me when I come back to the drawing in 6 months. For the purposes of this post I am assuming you have already created a corridor to include your roads Alignment, Profile, and an Assembly. Once you have done this, select and right-click on your Corridor to select “Corridor Properties”. 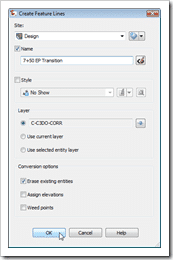 Go to the Parameters tab within the resulting Corridor Properties dialog. From here we’re going to create a region to represent the area of our parking stall. After creating a region to represent your parking (transition) area, we now need to tell Civil 3D how to transition. This can be done by selecting the “Target” column from the row representing my parking stall region. The Target Mapping dialog will then appear giving you control on how your corridor will behave within the specified region. In this case my parking stalls are on the right-side of my road. 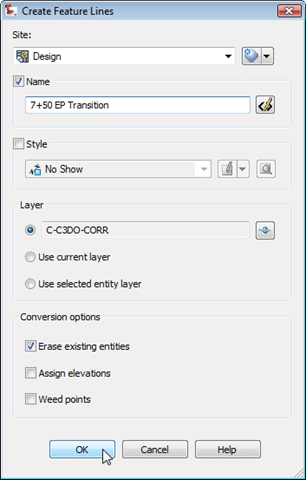 As mentioned within the subassembly portion of this post, I find it easiest to decipher which Transition Alignment to define when I name my subassemblies Left/Right. That said I can now select the Transition Alignment for my Right Subassembly. 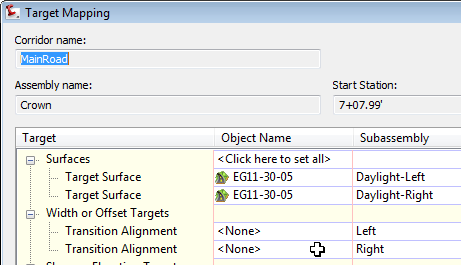 This will bring up the “Set Width Or Offset Target” dialog where you will want to click the [Select from Drawing] button. You can then select the Feature Line you created earlier to represent the Road EP. 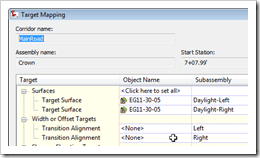 After selecting the Feature Line you should see it displayed under the “Selected entities to target” heading within the “Set Width Or Offset Target” dialog. At this point we’re done, and you can [Ok] out of each dialog currently open. Upon returning to the drawing you should see your corridor update to reflect the transition you just configured.